Our ranch is a part of the original Franklin Ranch established in 1868 and has been continuously operated by our family since then. 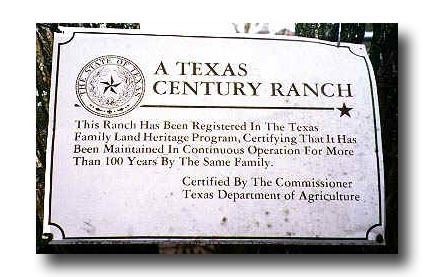 Its designation by the Texas Department of Agriculture's Family Land Heritage Program as a Texas Century Ranch is in recognition of over 100 years continuous ownership. 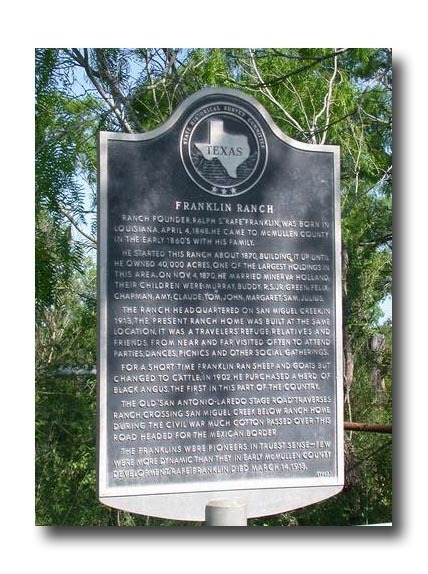 In 1967, the Texas Historical Commission included the ranch in its list of historical sites and awarded a Texas Historical Marker. If you're on a heritage tour, it's Marker No. 2054. The ranch has excellent populations of native whitetail deer, bobwhite and blue quail, Rio Grande wild turkey, javelina, and feral hogs, as well as hundreds of resident and migrant birds. Lucky visitors may even spot a bobcat or grey fox! Located half-way between San Antonio and Corpus Christi, we are in the heart of the Texas Brush Country. Both cities are serviced with daily flights by several airlines, and the 75-minute drive from either (via I-37 or Hwy. 16) will give you an excellent view of the S. Texas countryside as you travel to and from your hunting adventure at the Lone Star Camp.